Martial arts moves like these will improve your child’s balance. Try doing a kick straight out in front of you, executing another one out to the side, and then yet another one behind you, at imaginary attackers from all sides, AND without touching your kicking foot to the floor at any time. Sound pretty hard? Well, our little children in the five to seven age groups are able to do this by the end of the first or second term of martial arts! Standing on one leg while snapping kicks out in all directions takes incredible balance, learned through training in the martial arts. Some of the children have difficulty with it, but with a little praise and encouragement, they all finally get it. As the child advances they will learn spinning, turning, and jumping kicks, which are all amazing balance builders. The stances they learn teach them to keep a low centre of gravity and wider base, making it very difficult for a bully to knock them over. Focusing the eyes on a non-moving object out in front of them is something we teach them at the earliest stages of their training. Standing side-on from their opponents makes it harder for someone to push them down and increases their mobility while protecting their centreline, where most serious injuries will occur. Some of the warm-up exercises we do involve the children standing on one leg while pulling their legs out to the side, as if they were doing a kick. Or maybe the eagle, dancer, or tree pose from yoga. The kids love these exercises as they are a great challenge and lots of laughs are heard throughout the training hall. Sometimes for additional challenge, we have them close their eyes. Later on, when the children are ready to spar, or pretend fight, balance will play a key role in their ability to dodge their opponent’s attacks, while at the same time launching their own. The shuffling games and drills develop footwork, quickness, and balance as the the kids learn to move and evade attacks. Improving a child’s balance from martial arts training will pay big dividends in their lives. They will find other sports easier to master, and will be less likely to have accidents. This will be especially true when they one day become senior citizens. 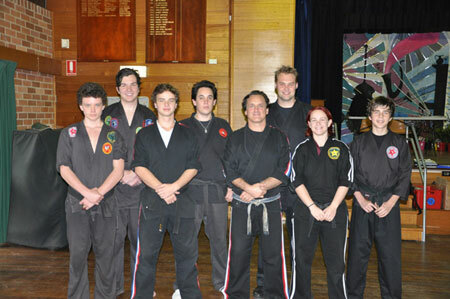 Being there to support your children is half the battle to their achieving success in martial arts. What can parents do to ensure their children succeed in martial arts or other sports? Mostly, it is about just being there for them and supporting them. I wrote this guest post a few years back. It received many responses, but sadly the host site no longer exists. I decided to re-write it on my own blog. I wrote this article from a unique perspective—that of the child’s. 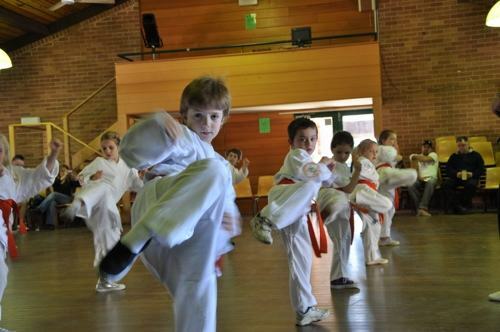 Our kids karate classes in Sydney are popular because the sensei get right “down in the dirt” with the children and actively participate, not just bark out orders. This gives us a different viewpoint. From my many years experience in working with kids, I offer this advice that will help the parent support their child in the martial arts or any other sport. “Be there whenever you can to watch me. It means so much to me and I will try extra hard when you are there”. “Be there to support me, especially on grading day. Every other parent is cheering for their child, but I am sad because there is no one here to cheer for me”. 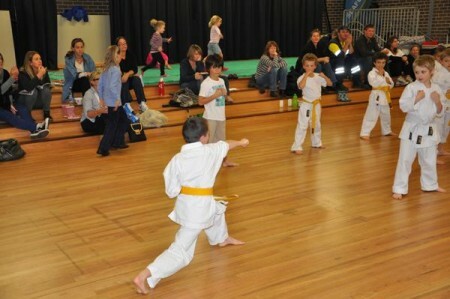 “Observe me quietly during my karate class with a smile on your face and always give me positive feedback when we get home, this shows me that you care.”. 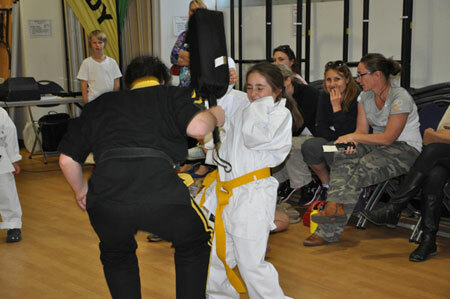 “It makes me happy that you volunteer when the sensei asks for parent helpers, I love seeing you take part in my class”. “Please pick me up from practice on time. All of the other kids have gotten their hugs and are gone and I am still here waiting for you. I feel abandoned and will cry”. “When you blabber loudly on your mobile phone and make the Sensei ask you to take it outside, it really embarrasses me”. “Help me with my belt if it falls off, the sensei is very busy and does not have the time”. “You told the sensei I am not any good at Karate. I thought he was proud of me. That really hurts”. “You have your face buried in the newspaper and have not watched one of my kicks today”. “Don’t push us too hard. 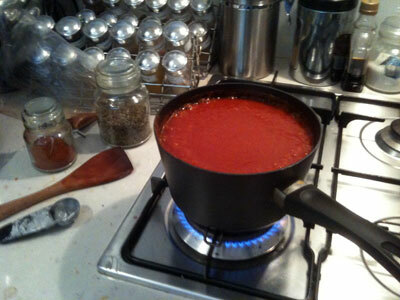 Practising five days a week is a bit much for our little bodies and it will soon become a job”. “Ask us what lessons we learned in karate today. It shows you care”. “Practice with me at home or at least watch me practice”. “Please sew up my karate pants so I don’t trip and fall down in front of the whole class”. “Please don’t compare me to other children. I am not as big, strong, and coordinated as Grant/Julie. It is not my fault”. “You sometimes get angry when I don’t win the game or match. The sensei says that what counts most is not winning, but having fun and doing your best”. “Do tell me you are proud of my efforts in karate. I live for it”. “Let us be kids and have a bit of fun. 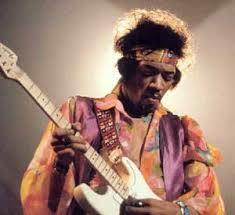 We only get to do it once”. How do you support your children in the martial arts or other sports? Your comments are appreciated. 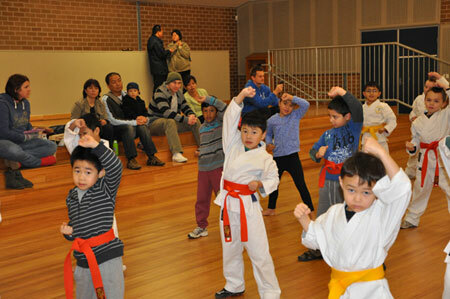 Kids are encouraged to raise their hands and be assertive in our martial arts classes. There are no wrong answers. Teaching a child to be assertive will pay off as they get older. Confident and assertive children are less likely to bend to the will of their peers. They will be more apt to walk away from a bad situation or to keep up good grades even when others say it is not the cool thing to do. Providing early leadership opportunities for children is essential for building their assertiveness and confidence. Research from Girl Scouts of America says confidence in speaking up and leading others dwindles by the fifth grade. Kids gain that confidence by entering into activities, clubs, teambuilding, etc. and the earlier the better. The martial arts is a perfect place to to this. Here’s why. 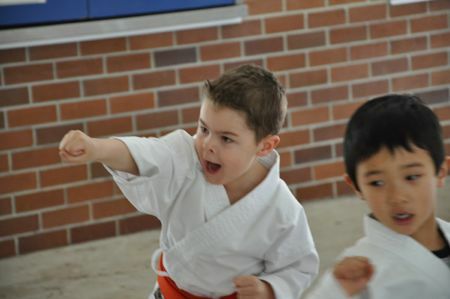 We praise children for raising their hands in our children’s martial arts classes. We tell them there is no wrong answer and that all questions or comments are good. We never belittle them for any answer they come up with. This gets them to put their hand up more often. Many parents are telling us their children are now putting their hands up in school, which usually means better class participation and grades. Children copy their role models. Our instructors encourage the children to stand up for their beliefs and views, even if it means going against the crowd. Many of the games we play test individual skills, which build a sense of independence. We also encourage them to speak up when they see injustice. 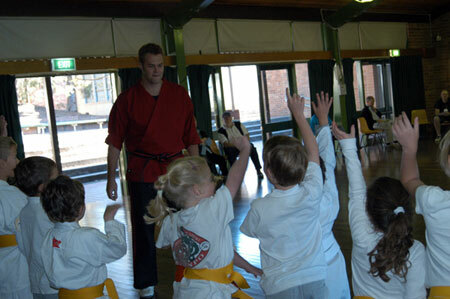 Our instructors also encourage the children to come forth if they are not getting enough attention in class. Children will follow the example of a strong instructor. If we see a shy withdrawn child being pushed around by a more assertive child in class we will separate them, giving the shy child the chance to shine on their own. We will go out of our way to find a way to give them a chance to be assertive and then praise them. We also tell them it is okay to complain if another child cuts in front of them in line. We also give the line-jumpers warning that if they are caught doing it, they will have to watch the game from the side that day. We encourage children to come forth and volunteer to be leaders. As early as purple belt, we will allow children to help with the beginner’s classes. This gets them started helping organise the class and works on their public speaking skills, greatly increasing their assertiveness. We teach our students to look people in the eye and use a more firm, powerful voice. We work on our Kiai every day to develop our voices. We encourage them to stay cool and not cry or pout, as this does not show confidence. Sometimes we’ll let the kids take turns running the stretches before class. Each kid picks a stretch, tells the class its name, then demonstrates it. They love to participate in it. Sometimes they come up with funny stretches and everyone has a laugh! It really builds their confidence in speaking up. Sometimes a child will walk up to me and say “I need to get tested because I missed the grading”. I tell them to try again but this time ask in a respectful way. They will often say “Can you please test me Sensei because I missed the grading? This teaches them that they will get a much better result if they make their requests in a firm, but respectful way. 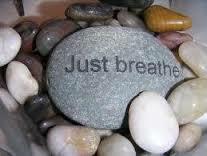 We teach our students to have faith in your their own abilities, knowledge and strength. To know that they are valuable and deserve to have their needs met. We all have a right to assert ourselves no matter what our personality. In the martial arts we give children the tools to be assertive and value themselves and their opinions so they will have high self esteem. It will show in the friends they choose and the activities they participate in and set them up for success in life.